Ekua Holmes has won two Coretta Scott King Illustrator awards. 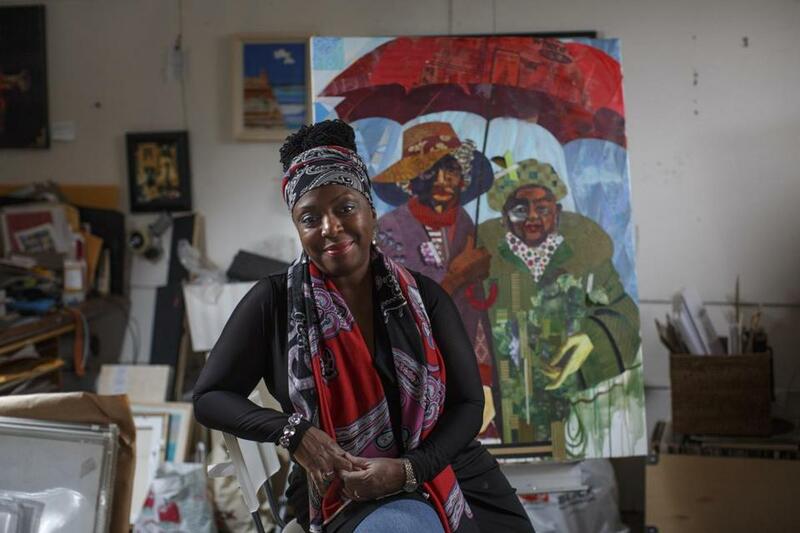 Roxbury artist, activist, and illustrator Ekua Holmes came late to illustrating children’s books, but arrived with a bang. Her first book, 2016’s“Voice of Freedom: Fannie Lou Hamer, The Spirit of the Civil Rights Movement’’by Carole Boston Weatherford (Candlewick), won a Caldecott Honor. Her second, 2018’s “Out of Wonder: Poems Celebrating Poets’’ by Kwame Alexander, Chris Colderley, and Marjory Wentworth (Candlewick), was awarded the Coretta Scott King Illustrator award. And her third, “The Stuff of Stars’’ by Marion Dane Bauer (Candlewick), has just taken that honor again for this year. “My first art museums and my first galleries were held in the pages of books I read,” Holmes writes in an e-mail. “This is what drew me into the world of art and what drew me into stories.” But it wasn’t until someone from the Somerville-based Candlewick saw some of her work in an ice cream shop that the opportunity to illustrate books became real. Romance novels may be a $1 billion industry, but they seldom, if ever, take center stage in the publishing industry. Silver Unicorn Bookstore in Acton is teaming up with bookseller Clarissa Murphy and former bookseller Katie Eelman to remedy that. The group will run a romance-only pop-up bookstore at Bow Market in Union Square in Somerville from Feb. 12-18. A Whirlwind Romance will have hundreds of titles in stock, spanning all corners of the romance realm, including LGBTQIA, fantasy, western, YA, historical, paranormal, mystery, graphic novel, and more. Paul Swydan, owner of the Silver Unicorn, says their aim is to shine a spotlight on the genre. The pop-up will also offer a few gifts as well as a photo booth where people can create their own romance novel cover, all manner of lotharios and swooners welcome. Penny McConnel at the Norwich Bookstore in Norwich, Vt., recommends “Right as Rain’’ by Lindsey Stoddard (HarperCollins): “Our heroine, Rain, and her family have recently moved from Vermont to Brooklyn to start over after a tragedy. Rain is finding it difficult to adjust to so many changes and is also keeping a secret from her family. This is a gentle yet strong and heartfelt story about family, change and friendships.